Mankind is on a mission to help guys everywhere look and feel better - fuss-free. Forget finickity fads and time-consuming efforts - with simple lotions, potions and products from innovative brands who are masters of the skincare world - every guy can get that refreshed and confident feeling every day. There’s no better way to take the grumble out of your grooming session than with truly delightful products in skincare, body care, for your hair and a close shave too. Here you’ll only find the best brands, from your classic favourites like Clinique and Molton Brown to bolshy Bulldog, calming Elemental Herbology and many more. Every brand at Mankind has something fantastic to offer. Whether you’re looking for the ultimate eye cream, skin supplement or body scrub, with Mankind you can target fatigue, ageing, blemished skin, unruly hair and more. All ailments can be conquered with the experts at hand, so don’t wait to discover a hearty catalogue of decadent products to fill your bathroom cupboards with. This is where your hero products are at, so for yourself, to treat your old man or a pal - find aftershaves to swoon over, home fragrance and more riveting goods to put a little more energy and luxury into your everyday. How do I use my Mankind discount code? Those which don’t require a code will be included in the order total so you can check out securely. Sign up to the Mankind newsletter for style news and a whole lot of VIP treatment. Is there a Mankind sale? You can find plenty of product offers online to save money with Mankind all year round. There is even an outlet full of discounted goods for your to invest in for less! How can I pay for my Mankind purchase? As well as all standard credit and debit cards including Mastercard, Visa and Paypal, you can pay for your order using Klarna. This payment system allows you to buy now, and pay later - you'll have 30 days to complete payment after your order is shipped. Where is the Mankind Salon? Located in Wilmslow, Manchester, find out more information online on how to get there. How does Mankind refer a friend work? 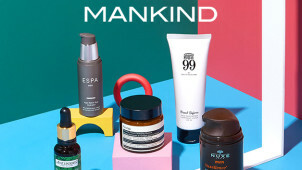 Not but a dream, sign up with a Mankind account and if you let your friends in on the Mankind secret, you’ll both get £10 off your grooming essentials! Do check the Terms & Conditions. You have 14-days in which to return your goods, you will have to contact the customer care team before hand for an authorisation number. Every discerning gentleman needs that go-to store for everyday grooming essentials. With Mankind you can find luxury toiletries for less, simply use a Mankind discount code to discover products galore that’ll turn your daily shave and shower routine into something far more riveting. With a catalogue full of suave brands like Aesop, Caudalie and Elemis - for your body care, grooming tools and much more - Mankind is the perfect place to visit. For your style scoop, grooming tips and much more, you can visit the Mankind blog. This is a realm of insight into how to fix up sharp, take care of yourself and your lifestyle too. With features on must-have products, trending topics, brand interviews and more - this is where to go for that contemporary lifestyle update. So for your seasonal recipes, new release product reviews, fitness mantras and everyday lifestyle inspiration - the Mankind blog has it all. Your skin says it all, when you’re well fuelled and feeling revitalised, right through to when you’re tired and run-down. With the top skincare picks from Mankind, you can always feel refreshed. Save with a Mankind voucher code and invest in a seriously regenerating skin regime to let you look groomed, day after day. Shop balms, cleansers, treatments and more - for all of your skin concerns - Mankind has the goods!